Taxotere® (docetaxel) is a prescription chemotherapy medication that is approved by the U.S. Food and Drug Administration (FDA) for the treatment of breast cancer, non-small cell lung cancer, advanced stomach cancer, head and neck cancers, and metastatic prostate cancer. The drug works by disrupting the ability of cancer cells to divide and multiply, preventing the growth and spread of the disease. Taxotere® is made by Sanofi-Aventis and is delivered intravenously as part of chemotherapy treatment. Unfortunately, many patients have suffered permanent hair loss (alopecia) after undergoing treatment with Taxotere®. These patients and their oncologists may have chosen another modality of treatment if the risk of complications associated with the medication were disclosed to them. This failure to warn patients of the inherent dangers of the drug has led many to file claims in the Taxotere® lawsuit. If you or a loved one have been prescribed Taxotere® as a chemo drug and suffered permanent scalp alopecia as a result, please schedule a consultation with a Taxotere® attorney for a free case evaluation. 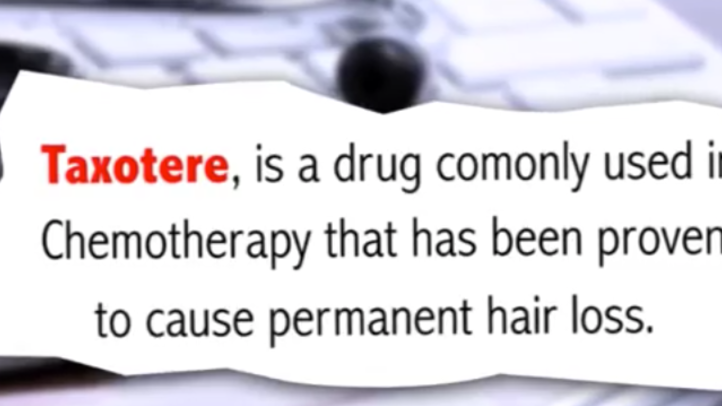 Taxotere® has been shown to cause permanent hair loss in patients. A chemotherapy regimen is a combination of medications that is administered to a patient for cancer treatment. These types of medications have different mechanisms of action, meaning that a combination approach employs drugs that attack cancer cells in different ways. Each patient’s cancer is unique and requires a treatment plan that is designed to target different types of cells safely and effectively. After reviewing all of your treatment options, you and your medical team will decide the appropriate combination of medications, dosages, and duration of treatment for your case. In December 2015, the FDA began requiring a warning of adverse reactions on the packaging of Taxotere®. Until that time, the labeling stated that “hair generally grows back” after finishing chemotherapy treatment and discontinuing use of the drug. However, the manufacturer’s own research studies indicated at least three percent of patients suffered persistent hair loss after they had completed their course of chemotherapy. A 2006 study conducted that 6.3 percent of breast cancer patients who were given Taxotere® as part of their chemotherapy regimen grew back less than 50 percent of their hair. Outside research studies have also shown evidence of this trend. A 2006 study conducted by Dr. Scot Sedlacek, an oncologist at Rocky Mountain Cancer Centers in Denver, CO, concluded that 6.3 percent of breast cancer patients who were given Taxotere® as part of their chemotherapy regimen grew back less than 50 percent of their hair. Taxotere® can cause permanent alopecia after chemotherapy treatment. Additionally, a July 2012 study in the Journal of Clinical Oncology found that newer cancer drugs (including Taxotere®) are associated with a significantly higher risk of long-term side effects and complications, and also have a higher mortality rate when compared to more time-tested therapies. This study analyzed reports on 38 new drugs that were approved by the FDA for cancer treatment between 2000 and 2010. This study found that patients who were randomly assigned to a newer cancer drug were 40 percent more likely to die from a complication, and 52 percent more likely to suffer a severe side effect than those who were taking an older medication. It is important to note that the risk of death from any of these drugs is extremely rare, but that the increased incidence of complications should be taken into account when determining the most appropriate form of treatment for each patient. Lawsuits filed concerning Taxotere® and permanent alopecia are in the very beginning stages. Our legal team is currently investigating any potential evidence that indicates a connection between the drug and the condition. This type of litigation typically requires a large investment of time and money long before a trial is brought before a jury in a district court. Personal injury lawsuits concerning defective drugs are typically handled as class actions or multidistrict litigation (MDL) cases. Both of these classifications are used to describe lawsuits that involve a large number of plaintiffs who have been injured, and the cases are combined before one judge. In a class action lawsuit, individual plaintiffs are represented by a smaller group, and all parties are legally bound by the results obtained. In an MDL, individual plaintiffs retain their own legal counsel, and the cases are combined before one judge to streamline evidence and discovery to reduce redundancies. Each claim is treated individually, and the results obtained by one party are not legally binding on any others. Each plaintiff and their legal team are free to make their own decisions about settlements and going to trial, regardless of what other parties decide. A study found that 10-15 percent of patients who were treated with Taxotere® may experience pervasive or permanent alopecia. The Taxotere® lawsuit will likely be handled as an MDL. Law firms from our legal network have built their careers by fighting large pharmaceutical corporations in similar cases where plaintiffs sustained injuries after taking a dangerous medication. This experience proves invaluable during each case as they can guide you through the lawsuit step-by-step, and provide sound legal advice for every situation. A study that was discussed at the 2014 NCRI Cancer Conference held in Liverpool found that 10-15 percent of patients who were treated with Taxotere® may experience pervasive or permanent alopecia. Their conclusions make recommendations for healthcare professionals to take this information into account when deciding on medications to include as part of a chemotherapy regimen. In a July 2012 article published in the Journal of Clinical Oncology, researchers concluded that newer medications for treating cancer were associated with a higher degree of risk of post-treatment complications, and more serious complications, including death. These findings do not suggest that newer cancer treatment drugs should not be used, but rather that greater care should be employed when deciding on the most appropriate form of treatment for individual cases. An article published in the Annals of Oncology journal, originally in May 2012 and later updated in October 2012, centered on the results of a study of women who had been treated with Taxotere® for breast cancer. After ruling out iron or zinc deficiencies, thyroid disorders, and hormonal fluctuations, their conclusions found that patients who suffered alopecia after treatment ended were unresponsive to therapies aimed at regrowing hair, such as vitamins, minoxidil, psoralen, and ultraviolet light with spironolactone. If you or a loved one has been prescribed Taxotere® as part of your chemotherapy regimen and experienced permanent hair loss following treatment, please contact a member of our expert legal team. It is imperative to explore your legal rights immediately, as each state has specific time constraints, called statutes of limitations, that a claim must be filed within. After this time has passed, the manufacturers of the drug are no longer liable for injuries that may have been caused by their product.